We support the work of the Big Green Book. 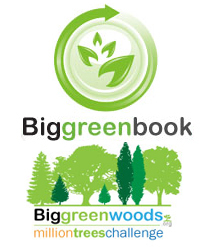 The Big Green book is a dedicated online directory that contains the names of businesses that are supporting environmental friendly business practice and working towards a greener future. For every contract we secure we will plant & pay for a tree. That's right, as part of our ongoing dedication to a brighter, greener future we have decided to do something really special. For every new contract that we secure we will purchase a tree, plant the tree and pay for the tree's maintenance as part of the Million Tree Planting challenge. The tree will be owned by you, you will receive the certificate of ownership to prove this and we will continue to maintain the tree for life on your behalf.